Home > Blog > WordPress Guides > What’s the Difference Between a Post and a Page in WordPress? What’s the Difference Between a Post and a Page in WordPress? Author: Martin Malden Published: November 15, 2015. Last updated: April 9, 2019. A good question and one that I come across often. WordPress started life in 2003 as a simple blogging platform. The word ‘blogging’ comes from ‘web log’, which was originally (way before 2003) a simple log of events that was stored online. The word ‘post’, in this context, comes from posting an entry in a web log – creating a post. Today, WordPress has evolved into the most popular web publishing platform globally, powering more than 25% of the websites online. It is also now acknowledged as a very flexible and powerful Content Management System. As a result, it looks very different now from what it did in 2003! It retains its blogging functionality, of course, but it’s now also used as the platform for normal websites – and there are many very large websites that are powered by WordPress, among them BBC America, Sony Music, Time Inc. and many others. But enough of that – on with the difference between posts and pages . . .
WordPress posts, then, are blog entries. By default, WordPress posts are listed chronologically on the blog post listing page, with the newest entry at the top. When you publish a new post the top one moves down and your latest entry replaces it at the top of the list. Clicking the post title (or the ‘read more’ link where that’s set up) in the posts listing page will take you to the full article. Posts, by default, include functionality that enables readers to leave comments or questions arising from the article – they were the first generation of social media, encouraging people to have discussions online. While commenting on blog posts in general has declined in favour of social media sites, some blogs, particularly those focused on a very specific niche with a devoted following, still host very vigorous conversations – much more so, and more detailed, than most main stream social media sites host! Because posts are dynamic (moving down the list as new posts are published) they do not normally appear in the site menu – they are reached via the ‘Blog’ or ‘Latest News’ label, which takes you to the blog post listing page. You can create a custom menu item to take people to a specific post if you want to – but I’ll cover menus in a later article. Posts also use WordPress’ filing system of categories and tags to group articles on the same or a similar subject together – which helps both readers and the search engines find what they’re interested in. Categories and tags is also a subject for a different article – click here. On a business website the blogging functionality is most often used as the ‘News’ or ‘Latest Updates’ page, where the company will post news of new product launches, events, sponsorship deals and so on. WordPress pages are not dynamic and they do not make use of WordPress’ system of categories and tags. They are simply static pages, exactly like websites have contained since the beginning of time. Because they are not dynamic they generally do appear in the website’s menu. I say ‘generally’ because you have the option to suppress a page from appearing in the menu – again, a subject for a later article. Pages do not usually offer the comment functionality that posts do. A page is often used as the ‘host’ for some specific functionality that’s delivered by a plugin or a 3rd party application outside of WordPress, such as some shopping cart applications, for example – EcWid, PayPal and Shopify are three. In this case a page is created with an appropriate title (e.g. Shopping cart) and the code for the shopping cart is embedded in the page. When you access that page from the menu the shopping cart is displayed and your visitors can carry out transactions normally. Another example: WordPress’ blog post listing is hosted on a page that you create and tell WordPress that it’s the host for blog posts. 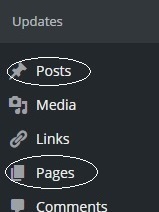 You create a new page via the ‘Pages’ menu item in the WordPress admin area. About the author: Hi, I’m Martin Malden. If you’re worried about the ever-increasing flow of new security threats online, don’t have the time to maintain your site properly, or you could use some WordPress training, please get in touch.